Hiring a PA system is all about trust. If you are renting PA equipment then it is more than likely that you don’t know much about it – how it should be installed, how it works, how to fix problems etc. That is why hiring from a company is an act of confidence and trust. A good AV shop will provide technical support as part of their core service as well as a technician on call for emergencies. As experts, they will advise and support you throughout your event, be it a business conference, a private party or a live gig. Dublin is a large city and there is a lot going on. If you are overseeing an event the chances are you will need people to be heard. An AV rental store will help you with this by providing the latest PA technology combined with expert know-how. There are many reasons why renting a PA system is better than buying one. It is more cost-efficient. You can make sure the equipment is exactly what you need. You can upgrade to the latest technology. However, the main reason is that the chances of something going wrong are minimized and, in the unlikely event that it does happen, the experts will know what to do. Expertise comes from knowledge and experience and we have a great deal of both. When you put your trust in a service, you expect to be taken care of throughout the process. We know how to take care of our customers. When working with our clients we aim to be consistent and deliver on all our promises. Trust in technical expertise and it will deliver the perfect solution for your sound enhancing needs. Investing in the latest PA technology and audio visual operators has made Audiovisual.ie one of the most trustworthy and expert AV hire shops in Dublin and Ireland. When organising an event there is a lot to consider and it can turn out to be a headache. A good AV rental company will aim to take care of the technical side of things and make life easier for you. There are many different companies in Dublin that offer PA systems and expertise. So, why go with us? Well, we’ve been in this business for almost 50 years and, in that time, we have grown in line with our customers’ requirements and have earned a name for being 100% reliable and trustworthy. 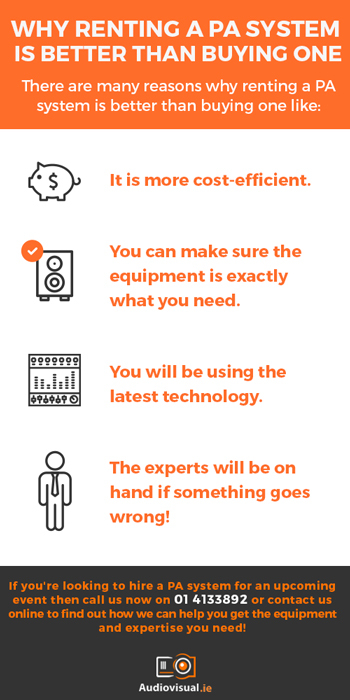 These are just some of the reasons why you should trust the experts with your PA system requirements and needs. Interested? Why not go ahead and make the call today and we can discuss exactly what it is Audiovisual.ie can do for you. Call us now on +353 1 4133 892 or contact us online for more info!